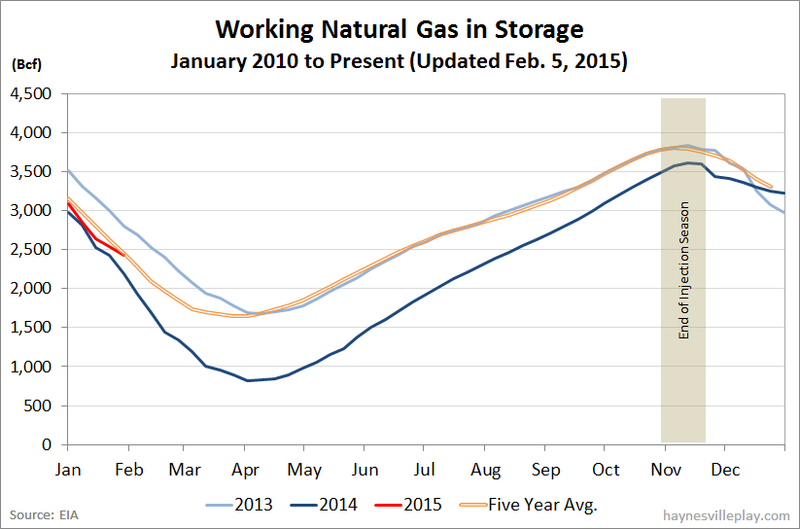 The EIA reported this morning that working gas in storage was down 115 Bcf last week to 2.428 Tcf. The withdrawal was 56% smaller than last year (-259 Bcf) and 30% below the five year average (-165 Bcf). The current storage level is now 23.9% above last year (1.96 Tcf, a difference of 468 Bcf) and 1.2% below the five year average (2.457 Tcf, a difference of 29 Bcf). With another lackluster withdrawal (the five year average withdrawal expected to be reported next week is around 178 Bcf), the current level will rise above the five year average.